“For where two or three come together in my name, there am I with them” (Matthew 18:20). Another indication that we don’t get this principle occurs at the end of really good meetings. Have you ever been to a great small group, worship service, conference, or some other Christian gathering and heard people proclaim, “Wow! God really showed up!”? Of course he showed up. He always does when we come together in his name (or because we are his, as the New Living Translation puts it). You be sure to show up. Remember the fact that you’re not just meeting with a few other Christian friends. You’re meeting with Jesus. What an incredible honor that is! Show up as the real you. You may think you can fool some of your fellow group members, but not Jesus … and, truthfully, probably not even your other group members. Open yourself up, trust others to accept you as you, and allow the Holy Spirit to work as you reveal your true heart. Show up with an expectancy and anticipation for God to move. Gather in Jesus’ name, for his sake, because you are his. Don’t just meet for the sake of doing a study or because you are a member of the church and the pastor expects it! Meet in Jesus’ presence, for his purposes, and in his power! 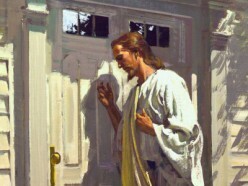 Welcome Jesus into your presence. We have a religious term for welcoming him; it’s called worship. This “worship” does not have to take the form of your Sunday-morning experience. It doesn’t have to be traditional. It can be (and perhaps should be) a simple outflow of welcoming Jesus into your meeting time, recognizing his leadership and power, honoring him as if royalty just walked into the room. He has. What else can you do to welcome Jesus into your small group and to remember he is present throughout your meeting time?